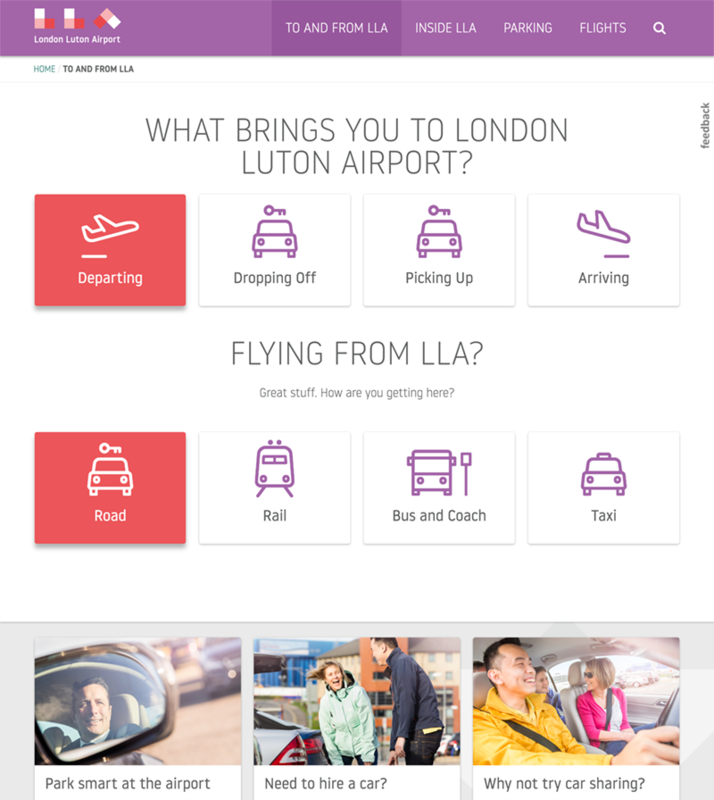 Our website for London Luton Airport (LLA) has helped them improve communication with travellers, increase online revenue and launch a new and exciting brand. Built on the Kentico web platform it integrates with flight systems, travel services and their parking reservation software to provide customers with live travel and reservation information. London Luton Airport (LLA) is undergoing a strategic business transformation project backed by venture capital funding. They plan to double passenger numbers by 2025 by breaking the Gatwick / Heathrow duopoly, positioning LLA as a viable alternative for domestic and business travel to and from London. LLA was the 11th largest airport in the UK when we started working with them - they’re now 5th. We were awarded this contract on the back of our pitch which was designed entirely around the needs of the Smiths, a family catching a flight for their yearly holiday. We knew this customer segment found airports quite stressful. Working from a story of what the family looked like, how they are likely to travel to the airport and potential pain points we explained how the website could help them. Once inside the airport the informational and service needs of each customer group can be very different. For example while families might be looking for soft play areas, business travellers are more likely to need a charging point and a coffee. We designed the site around these user groups enabling easy access to the most relevant content. We also wanted to deal with the challenge of having up to date departure information. We tackled this by allowing users to pin their itineraries to their mobile phone browsers for immediate access. Commercial arrangements with The Trainline and transfer companies meant that we could provide the latest travel information for arriving passengers. As well as making it possible for returning customers to book tickets before they landed we created screens inside the airport to help them find onward travel connections. Throughout the planning stages of this project we concentrated on User Experience and Design first as this would help to inform the choice of technology. Once we had agreed the site architecture, visual design and technical requirements (covering seven complex third party integrations), we advised on the platform which had the best fit. In this case Kentico had the best fit because of its well featured, integrated eCommerce engine and advanced web personalisation and marketing automation tools.